Evidence is now suggesting that periodontal disease can be a risk factor in cardiovascular disease and respiratory disease. 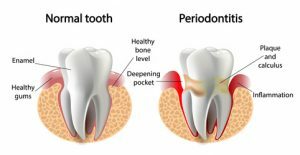 People with periodontal disease are at greater risk of heart disease and have twice the risk of having a fatal heart attack than people without periodontal disease. It is believed that the bacteria that causes periodontal disease may cause small blood clots to form that can contribute to clogged arteries and build up of fatty deposits within the heart arteries. Periodontal disease has now been shown to be a risk factor for having premature or low birthweight babies. Mothers with periodontal disease may be at a 7 times greater risk for having a premature or low birthweight baby. Periodontal disease has been known for some time to be interrelated with diabetes. Bleeding gums, bone loss and an increase in pocket depths may be an early indicator of diabetes. Diabetics are more susceptible to periodontal disease and often require more periodontal care than non-diabetic patients. Periodontal disease activity is often related to the level of control of the diabetic patient’s blood sugar. Smoking and periodontal disease are linked as well. Smoking reduces the blood supply to the surrounding bone of the tooth. The intense heat and toxins produced during smoking can also affect the bacterial composition of the mouth and the body’s immune response to periodontal bacteria. Smoking reduces the effect of periodontal therapy regardless of the level of oral hygiene.